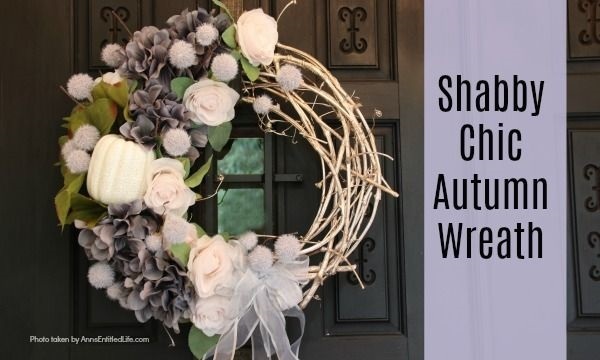 If you are a fan of shabby chic décor for your home, you are going to want to make this lovely shabby chic autumn wreath! 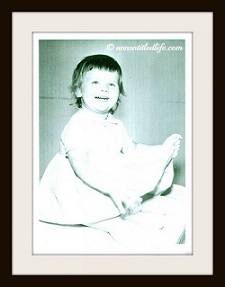 Simple to make, the soft and understated colors are perfect shabby chic wall décor or door décor. The secret is in the colors. 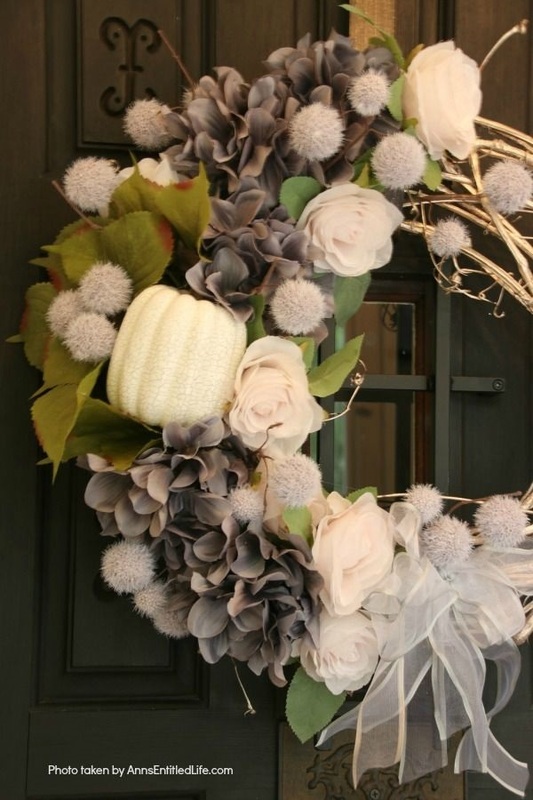 It is a muted color wreath, not the sharp yellows, oranges, and reds commonly found in Autumn décor. • This is a quick-to-put-together the wreath. It will take you 30 minutes (probably less). 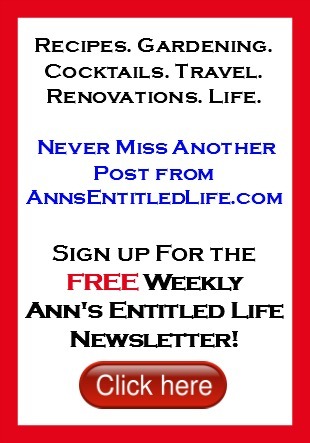 • The focal point is the pumpkin (you could use another type of gourd if it pleases you). The flowers form a cascade that surrounds the pumpkin. 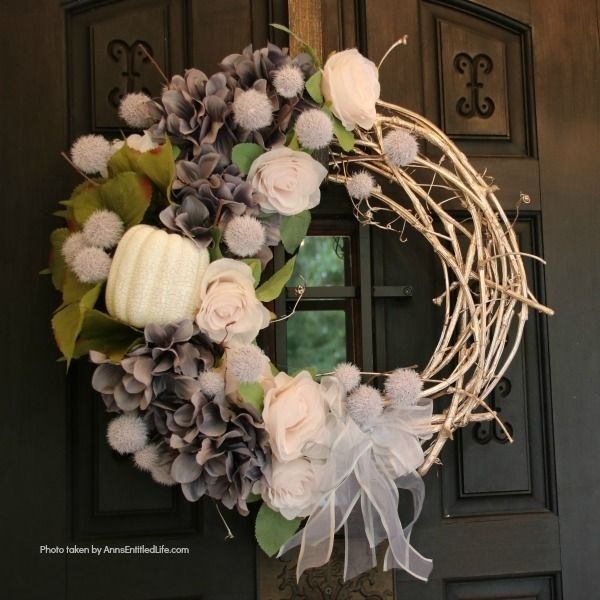 What makes this wreath different is the colors – a light blush rose, a rose gold wreath, lavender, and gray flowers… unexpected, yet traditional. A great juxtaposition of old and new! • The grapevine wreath is rose gold. 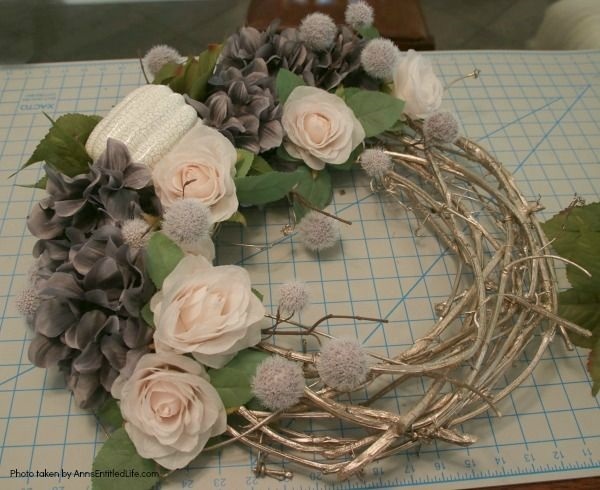 If you cannot find a rose gold wreath to purchase, of if you already have a non-rose-gold grapevine wreath laying around in your craft stash, you can always spray paint a grapevine wreath rose gold. • Hydrangeas can be difficult to work with because they are so massive. It is an excellent flower to use on a grapevine as it provides broad coverage, however, it usually looks better if it is broken up a bit. 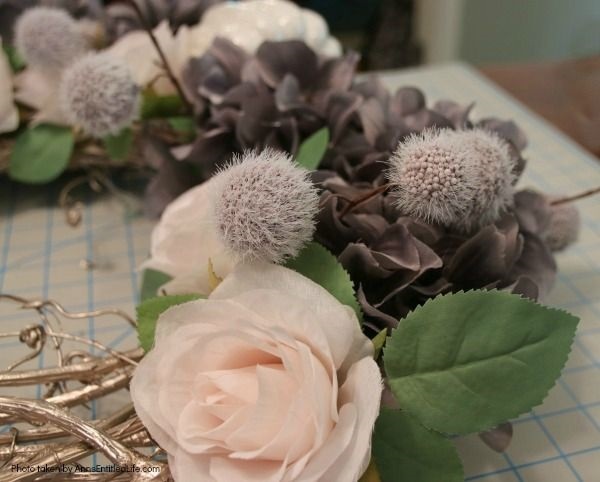 • Thistles were used (with a bit of the “wood”) to make the wreath seem more “natural”. Leaving a bit of the stem gives the shabby chic wreath a bit of a “woody” look. 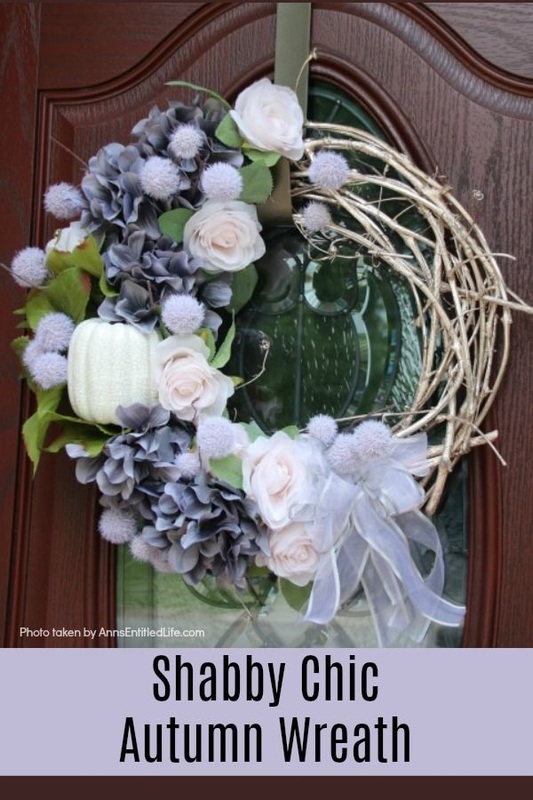 • The ribbon chosen for this wreath is silvery. You can choose grey, rose, lavender, etc. Use what matches your flowers. 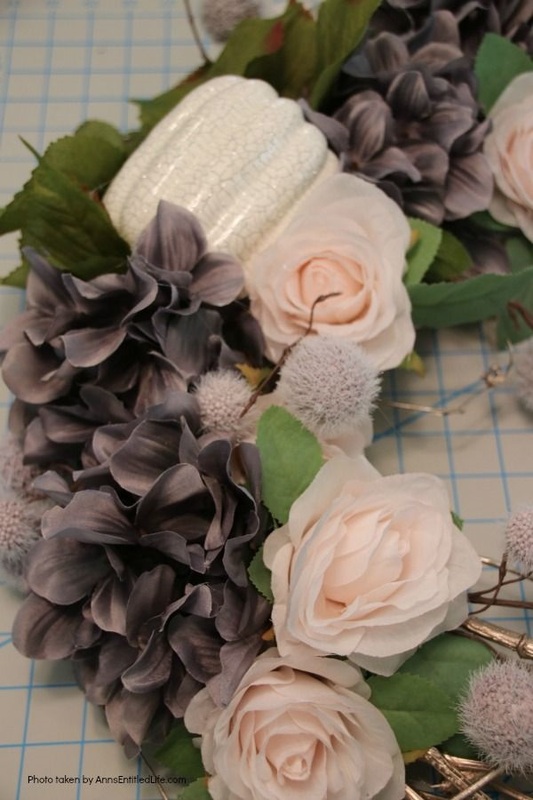 Pick a rose ribbon for the pale rose blush, a purple ribbon for the hydrangea, or as we chose, a silver ribbon to compliment the entire wreath. Make certain it is a wired ribbon if you are making the bow yourself, and not purchasing a premade bow. Wired ribbon is generally easier to work with. Big, small, or medium bow, any will work with this wreath. It just depends on the look you are seeking. Note: everything on this wreath was purchase at my local craft store last week. Autumn is in-season at your local Jo-Ann Fabric, Michaels, and Hobby Lobby right now! 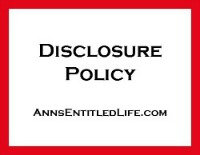 • Separate leaves from hydrangea flowers, reserve the leaves for later (ie, do not toss anything). With a grapevine wreath, it is difficult to hide stems. You may end up doing a double clip – one you “think” will be short enough, then a second clip of the stem that really is short enough! It is tough to hide stems in a grapevine wreath! 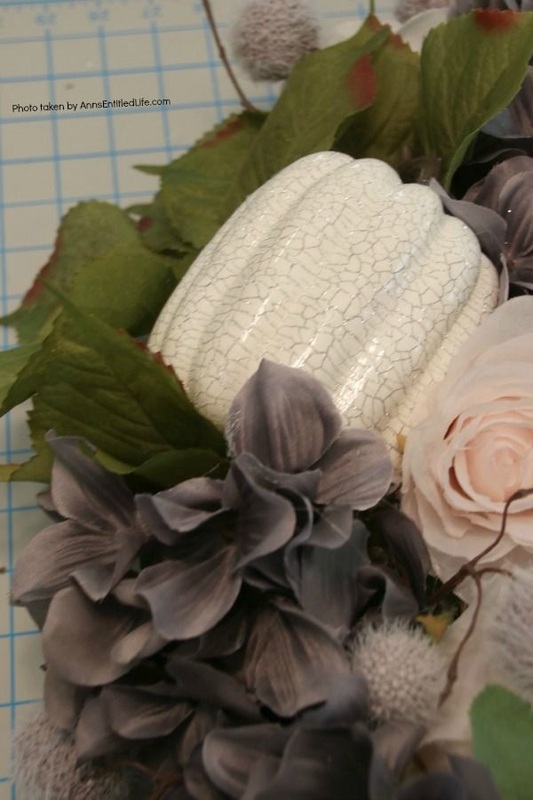 • Hot glue pumpkin in place on your grapevine wreath. 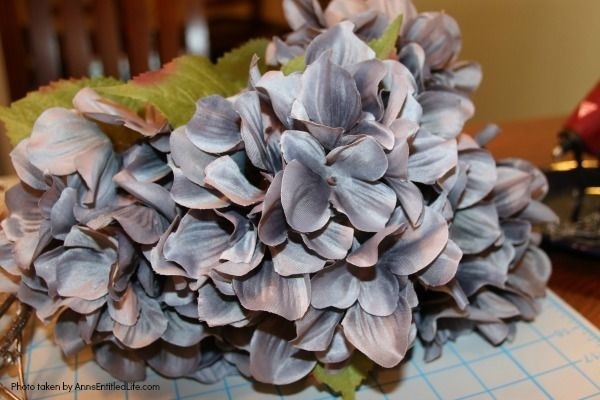 • Build the hydrangea flowers around the pumpkin. This is two on the bottom, three on top. The larger hydrangea flowers went to the inside, the smaller flowers went to the outside to compliment the pumpkin and start to form a cascade. 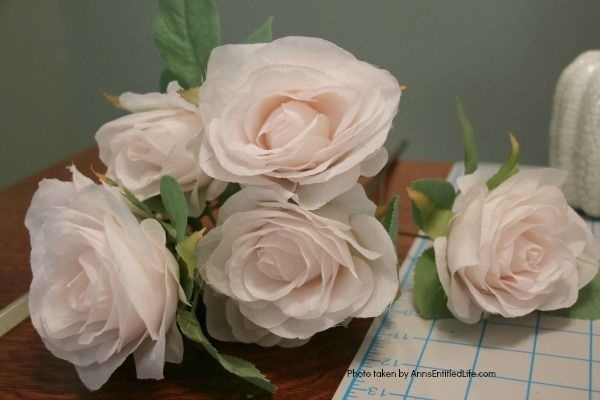 • Hot glue flowers in place after you are happy with their placement. Always place items before hot gluing so you can adjust positioning to be more astetically pleasing. You want a cascade of flowers, punctuating the hydrangea flowers with the roses. • Clip the thistle leaving a bit of the wood “bark”. 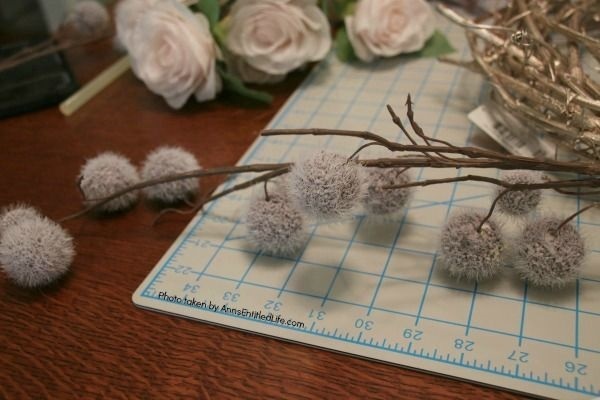 • Add the thistle in to break up the hydrangea flowers. • Hot glue thistle in place. • Tuck in some of the hydrangea leaves around the pumpkin to highlight it. The pumpkin will get lost in the background otherwise. 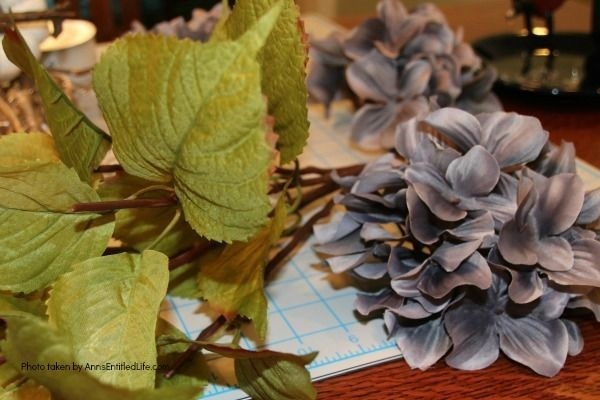 • Hot glue hydrangea leaves in place. The leaves will help the pumpkin stand out. 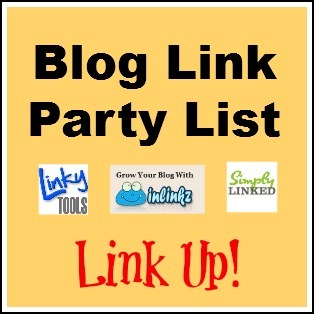 • Make a bow with you ribbon if you have not purchased a premade bow. 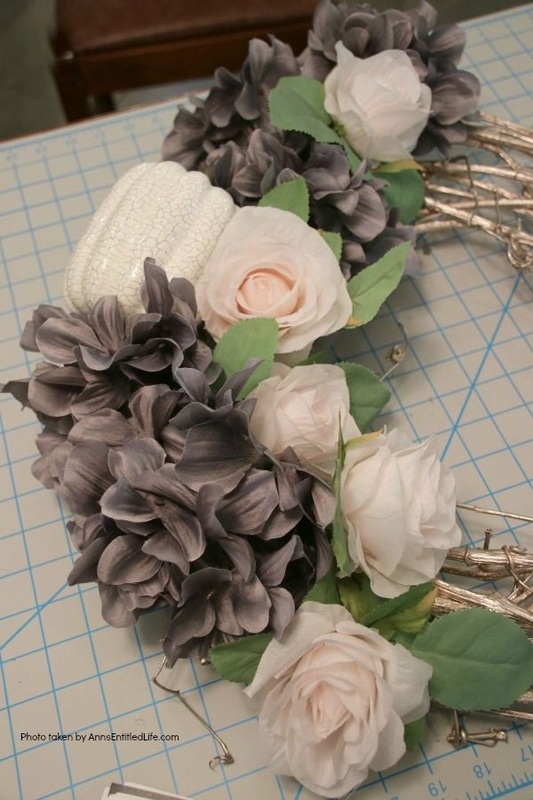 • Attach bow at the bottom of your flower cascade. 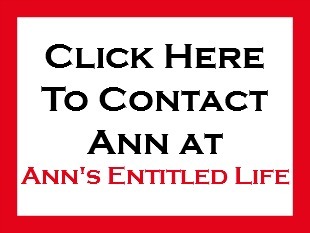 • Attach a ribbon for a hanger if desired. 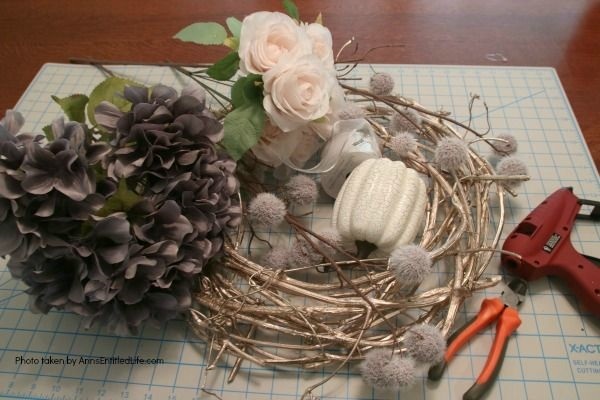 • Pick up the wreath and give it a light shake to see if any of the flowers fall before you unplug your glue gun! If any are loose, hot glue in place! • Rustic Fall Burlap Wreath DIY – This DIY tutorial on how to make a Rustic Fall Burlap Wreath has easy to follow, step-by-step instructions. Less than an hour or so of your time results in a lovely autumn wreath that is highly customizable, and a lot less expensive than a store bought wreath! Perfect fall decor for your front door. • Sunflower Knot Wreath – This DIY tutorial on how to make a sunflower knot wreath has easy to follow, step-by-step instructions. An hour or so of your time results in this lovely sunflower knot wreath, perfect for your front door! • Homemade Autumn Spice Soy Candles – Easily and inexpensively make your own Homemade Autumn Spice Soy Candles! 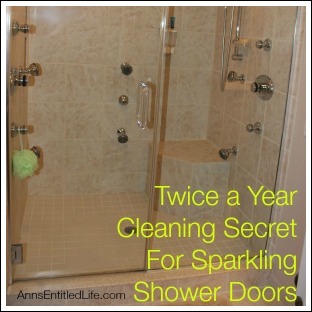 These are great for gifts or to scent your own home during the fall and holiday season. These Homemade Autumn Spice Soy Candles are a fun DIY project that yields great results! 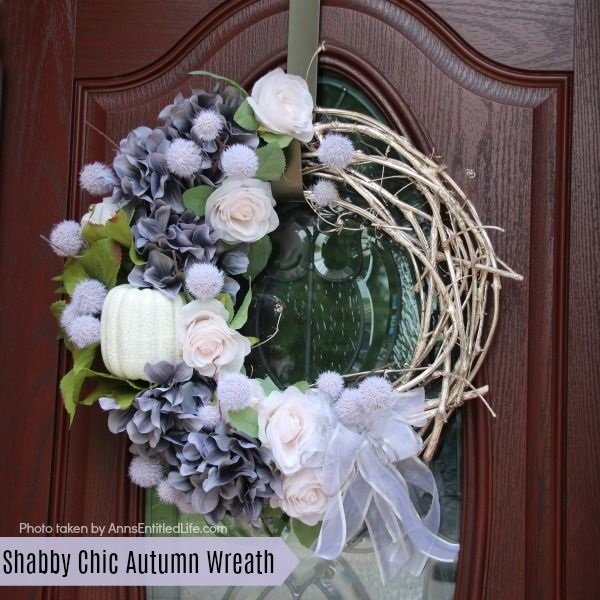 What a pretty shabby chic wreath. I’ll be featuring it tonight at Merry Monday.